Acupressure and tapping are based on an ancient principle of healing — that simply touching / tapping a specific point on the body will release stress and improve health. In an acupressure or tapping session, firm pressure is applied or tapping is done to points on the body, relieving muscle tension and improving circulation. These simple and powerful techniques have been shown to be very effective in treating headaches, backaches and even insomnia. These techniques are often given as homework for the patient, allowing continuation of treatment beyond the office visit. Cupping has been a part of Chinese Medicine for over 2,500 years. It relieves aches and pains, improves circulation, and also helps with respiratory and digestive issues. By simply placing a specialized “cup” onto specific points on your body, and then using suction to pull your skin up into the cups, fresh blood is drawn to that area of your body. This facilitates the cleansing and strengthening of your Qi (energy). It does not hurt, and the end result is a greater overall sense of health and well-being. Although Gua Sha is an ancient healing technique used by Chinese Medicine practitioners for thousands of years, it is relatively unknown in the West. It is recognized throughout Asia as a highly effective treatment for chronic pain conditions, stress, fatigue, and a host of other ailments. First, Gua Sha oil is applied to a specific meridian (energy pathway) on your body. Then, a smooth round-edged object (such as a spoon) is used to apply short brisk strokes to that area. This creates red patches of skin (called “Sha”), detoxifying your blood and restoring the healthy flow of Qi (energy) to the area. There is no pain involved, and the Sha will fade in 2 to 3 days. But the sense of health and vitality you experience from it will last much longer. Moxibustion is a Traditional Chinese Medicine technique that involves the burning of mugwort, a small, spongy herb, to facilitate healing and health. Moxibustion has been used for healing purposes throughout Asia for thousands of years. The purpose of moxibustion, as with most forms of Traditional Chinese Medicine, is to strengthen the blood, stimulate the flow of Qi (energy) and enhance your overall vitality and health. Among other benefits, a landmark study published in the Journal of the American Medical Association in 1998 found that 75.4% of women suffering from breech presentations before childbirth had fetuses that rotated to the normal position after receiving moxibustion at an acupuncture point on the bladder meridian. One of the most common questions that patients ask about Chinese Medicine is: “Why does my practitioner check my pulse?” Pulse diagnosis is actually one of the most complex and important diagnostic techniques used in Chinese Medicine. Through feeling and evaluating your pulse, an accurate diagnosis of your overall constitution, Qi (energy) flow, and internal organ health, among other things can be obtained. All of this information is then synthesized into a highly effective and individualized treatment plan for your specific needs. Reiki is a Japanese form of energy work that cleanses and balances the energy system in the body. As a result, the body’s natural self-healing mechanisms strengthen, helping to establish optimal health. During a session, the energy field is engaged to remove blockages, detoxify the system and restore the vital life force by utilizing a gentle laying on of hands. The benefits of Reiki range from the release of habitual mental/emotional stress to alleviating chronic pain. The Reiki healing is a precise technology that opens the body’s energy channels (meridians and chakras), which induces natural healing, helping to alleviate pain. Tui Na is an ancient form of bodywork that is based on the principles of acupuncture. Using a variety of pressures and strokes along the meridians (energy pathways) helps to relax muscles and stimulate the flow of energy throughout the body. Both the physical (musculature) and energetic (Qi) levels are treated at the same time, achieving great results. “I Ching” translates as “The Book of Changes”, which has been used in China for thousands of years. It is a precise method of divination that can be done in person, by phone or on Skype. The answers or predictions of future events are revealed by using a numerological system based on Yin and Yang. Traditionally, a bundle of yarrow sticks were thrown but the modern equivalent uses three coins for divination that are tossed six times to form the lines of a hexagram. The “Book of Changes” is then used to interpret the meaning of the hexagrams in relation to the specific question asked. There are sixty-four possible configurations of the hexagrams; each one represents a process in nature or in human nature and can reveal future luck, growth, or misfortunes. 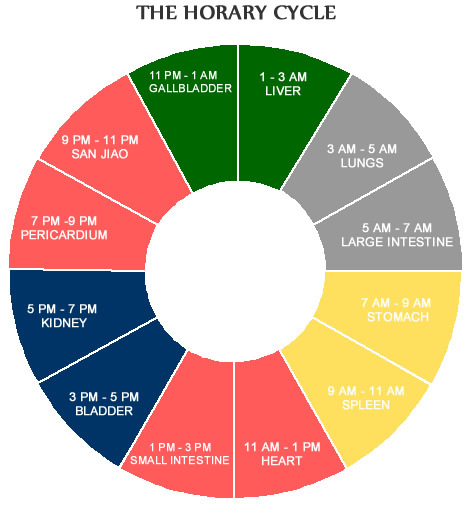 Horary treatments consist of five individual tune-ups performed during specific times of the day and year. The five seasons – Summer, Late Summer, Autumn, Winter and Spring – each have predominant qualities expressed in nature that correspond with the functions of our body, mind, and spirit. Receiving treatment during these phases brings alignment to these energies in nature. For those situations where nothing has worked, when conventional treatments cannot heal your pain, acupuncture is a natural method of pain management over time. Patients use it for various types of chronic degenerative health issues. Numbness, weakness, joint, muscular and nerve pain are examples of what can be managed with treatment.